Pharmacovigilance Outsourcing Market size is set to exceed USD 7.5 billion by 2024; according to a new research report by Global Market Insights. Increasing emphasis of several pharma and biopharma companies on new drug development for treatment of chronic diseases is one of the key drivers that will render positive impact on the pharmacovigilance (PV) outsourcing market growth. Pharmaceutical companies need to focus on several pharmacovigilance activities including remote monitoring for clinical trials, clinical operations, regulatory affairs, statistical analysis, quality assurance, evaluation and approvals of the project with necessary clearances and documentation. Setting up in-house PV department is not always cost effective and involves several challenges such as high costs for maintaining compliance levels and availability of trained in-house human resource. Growing inclination of pharma companies towards PV outsourcing facilities offering aforementioned functions will boost pharmacovigilance outsourcing industry growth in the coming years. Furthermore, pharmaceutical drugs used in prevention and treatment of diseases have a high risk of adverse drug reactions (ADRs) that can cause serious harm to patients. This has led to increased focus of companies on monitoring of adverse drug reactions throughout the product life cycle, from pre-clinical trials to post-market surveillance. Thus, growing need for detection, assessment, understanding and prevention of ADRs will surge the demand for pharmacovigilance activities thereby accelerating the market growth. However, issues pertaining to data security and dearth of skilled professionals for performing PV functions may impede pharmacovigilance outsourcing business growth during the forecast period. Post-marketing services segment dominated the pharmacovigilance outsourcing market with USD 2.1 billion revenue in 2017 and is estimated to show significant growth over the analysis timeline. Segmental growth is attributable to the increasing number of ADRs associated with the newly developed drugs. Growing demand for several post-marketing services including adverse event case analysis and reporting, regulatory submission, reconciliation of pharmacovigilance database with clinical database and population studies & pharmaco-epidemiology assessment will spur the segment size. Contract research organizations (CROs) segment accounted for the largest revenue share in 2017 and is estimated to witness 15.9% CAGR during the forecast timeframe. The segment growth is attributed to various case management activities that are majorly outsourced to the CROs. Increasing focus of the top CROs including IQVIA, Parexel and SIRO Clinpharm on developing innovative PV services such as medical writing, safety surveillance services and case processing services will further accelerate the segment growth in coming years. 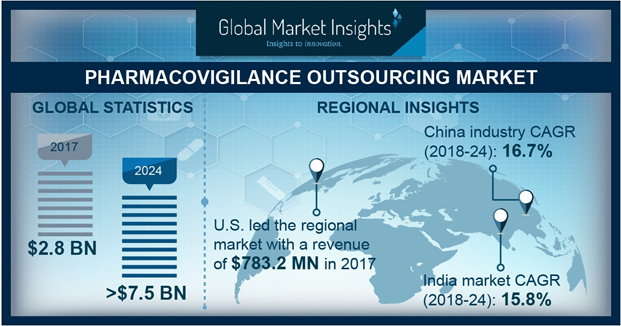 U.S. pharmacovigilance outsourcing market dominated North America region and was valued at USD 783.2 million revenue in 2017 and is estimated to witness similar trend during the forthcoming years. The high growth is attributed to strong foothold of major pharma and medical device companies coupled with extensive drug development activities in the U.S. Moreover, high healthcare expenditure in the country and growing concern regarding drug safety and adverse drug reactions among the population will boost pharmacovigilance outsourcing business growth. China pharmacovigilance outsourcing market held significant revenue share in 2017 and is projected to show highest CAGR of 16.7% over the forecast timeframe. The growth is attributable to the comprehensive pharmacovigilance system in China that covers organizations and regulations related to pharmacovigilance outsourcing. Furthermore, availability of Adverse Drug Reaction (ADR) Monitoring System, a spontaneous reporting system in China that connects the four-level pharmacovigilance network will render positive impact on the market growth. Prominent industry players operating in the pharmacovigilance outsourcing market are Accenture, Bioclinica, , Clintec, Cognizant, Covance, Ergomed, Genpact, IBM Corporation, ICON, iGATE Corporation, iMED Global Corporation, Infosys, IQVIA, MarksMan Healthcare, Medpace Holdings, Novartis, Oracle Corporation, Parexel, PRA Health Sciences, SIRO Clinpharm, Symogen, Syneos Health, Tata Consultancy Services (TCS) and Tech Mahindra. Key industry players are majorly focusing on strategic initiatives including acquisitions, merger and partnerships to strengthen market position and capitalize on market opportunities. For instance, in June 2018, Genpact acquired Commonwealth Informatics, a leading provider of cloud-based drug safety analytics services and products for medical research and healthcare delivery. The strategy will help Genpact to strengthen its pharmacovigilance AI capabilities for ensuring drug safety thereby fostering company’s growth.